​ Week 7 Puppy Pictures: More individual puppy pictures below. We ask $1750 for our Quality-raised, Champion Pups. $2000 with delivery to 48 states--call for other shipping. Reserve list for the Fall Litter of Champions Colt and Orcrist's litter of English Cream European Golden Retriever puppies. Cheesecake is back available after being held for a family who had a change of plans. He is a real sweetheart and is very easy to train. He is big, solid and has a beautiful look. To get pictures I had to have my son hold him (or he would be on my lap--where he loves to be most!). He is a super puppy that I know will be a great dog for years to come. Cheesecake is growing really fast! He is long and sturdy in his build. He really mellowed out this week and is very relaxed when you hold him. He loves to go exploring outside. The puppies have continued to get bigger and remain the largest puppies that I have had. This litter has been a complete treat for me as they are so advanced compared to they others. I am crate training now and this is the first time that I have not even had a single accident. I began with 6 hours and they now stay in their crates at night for 8 hours. More than that, this is the first group that I've ever had that is also almost completely dry as well. They should be very easy to house train at this rate. Our weather has been better and they have had several days where they have gotten to be outside for more than 2 hours. They are very obvious in their love of the outdoors. I will add weights and heights on Saturday after their veterinary health check-up. I will then give some more observations about each puppy. Enjoy the pictures! Adopted by Caitria C. and Joe G.
French Vanilla was adopted by my daughter and her fiance. She still did not pass her health certificate (though my research tells me that she will in 2 months) so she has found a great new home where she will be loved. French Vanilla is also very active and loves to play fight and explore. Her fur is getting the wavy look of her father. Butter Pecan really outgrew her fellow girls this week. She continues to love being held and petted but will play fight when she is outside. She likes to explore, but does so with the group. Adopted by Timothy & Ann T.
Pina Colada continues to be very active and also loving. She comes to a call. She also loves to play fight. Chunky Monkey is active and loves to explore when outside. When he is inside, he loves to be held. He has an incredible coat. Adopted by Matt & Sarah W.
Junior Mint has stayed small but now he will play fight with the other puppies. He is incredibly cute and loving. He loves to be held and cuddle and will lick you if you let him. He likes running around outside and he explores as well. Rocky Road is still Mr. Everything. He still is the most active, adventurous and he loves to be held. He loves exploring and being outside. He is starting to get his big boy body--catching up to the other big boys. Tigertail is very active and loves to explore and run when outside. He is also very relaxed when inside--waiting to be held because he knows the routine. Adopted by Dan & Julie S.
White Chocolate Blizzard is active but loves to be held. His coat has really filled out this week and is starting to look more like his father's. I added the Week 5 Part 2 information 2 days ago so I am going to copy and paste the most important information to this week. It was only 2 days, but I was able to spend a couple of hours outside with them and I really got to see even more of their personalities coming through. It was absolutely amazing to watch them explore, come back to spend time with me, explore some more, come back again and so on and so forth. I normally try to get them outside at week 5--weather permitting. It really seems to make a difference in their acclimation to multiple environments. Hope you enjoy the new set of pictures. Pina Colada loves to playfight. She is the second most active puppy in the litter next to Rocky Road. She likes to be held and petted. She seems very intelligent. Cheesecake loves to run around and play fight with Rocky Road and Chunky Monkey. He has a thick coat, though not as long as some of the others. He is very loving and likes to held, though he will want to get down an play after a while. Junior Mint is our smallest puppy by a lot. However, I have had 8 week old puppies that were 6 lb 2 oz so he is just small in this very advanced group. He does not play fight, though he loves to explore and visit with the older dogs. He loves being held. He is very affectionate. Unique: small, cute and cuddly. He is a lover and not a fighter. Rocky Road is our most everything puppy (most active, most friendly, most explorative). He is the size of our female puppies, probably because he is burning all of his energy play fighting, exploring and running around. With all of his activity you would think he would be too hyper to stay still but he loves being held and will stay in our lap as long as he can. ​﻿Our Girls and Boys with new homes! Butter Pecan is our most affectionate female and loves to be held. French Vanilla is a beautiful girl. She is active and play fights with Rocky Road. She likes to be held and petted but prefers play fighting at this point. Chunky Monkey is one of our three bigger puppies. He is independent and will explore new environments. He likes to play fight with Rocky Road and loves to sleep in your arms. He will stay there for as long as you will let him. Tigertail is now our second largest puppy. He loves to explore and is active. He is very loving and likes to be held. Unique: Loves to explore and has grown very solid. I think he is the most intelligent as he picks up on routine much faster than the other puppies. White Chocolate Blizzard is our biggest puppy. He also has a very thick coat and wide set eyes. He is cute and loves to be held. He play fights with Rocky Road. Unique: spectacular coat and build. Visually very similar to Chunky Monkey. Coat is longer but not as thick. Today and tomorrow I will be adding as much information about each puppy to help those with reserves get a better idea about each puppy. They keep changing so quickly that it is hard for me to keep up with them and I see them for hours every day! Tomorrow, I plan on getting a scale that can measure their weights so I can give an accurate idea of their size. Also, I will give their heights, lengths and fur length. I will also try to highlight what is unique about each puppy. For today, here is another set of pictures and their temperament test results. As you can see, we did their temperament testing!! Please take a look. This will help you select your puppy, see what they are like before training, and give you a great general idea of an English Cream's temperament. I have weighed and measured each puppy. I was fairly sure that our largest puppy had changed this week--that was why I decided I needed a scale measurement. On the back height I tried to get an actual measure without fur, though this was difficult. On length, I tried to have each puppy stand with their head straight forward and then I measured from the tip of the nose to their rear end (no tail). Fur length is in centimeters to make it easier to compare. Hope this information helps. Pina Colada loves to playfight. She is the second most active puppy in the litter next to Rocky Road. She likes to be held and petted. Chunky Monkey is one of our three bigger puppies. He is less explorative than others at times, though he will explore when it is picture time. He likes to play fight with Rocky Road and loves to sleep in your arms. He will stay there for as long as you will let him. Week 5: The puppies really gained muscle and thickness this week. Their bodies are solid now and they are looking spectacular. The big boys look like they are ready to leave already, though they must be 8 weeks. This is an active group yet every single puppy loves to be held, petted and cuddled. Some of the puppies are definitely getting a thicker coat than others. Those with the thickest coats are Chunky Monkey, Cheescake, Tigertail, White Chocolate Blizzard, and French Vanilla. Each of these are getting thick coats and some are already starting to look a little wavy. Four puppies have nice coats (superior to any previous litter) and they may grow into the thick coat, though it is not as obvious yet. They are Butter Pecan. Pina Colada, Junior Mint and Rocky Road. It is obvious that Colt's coat is coming through in his puppies! Here are the character traits that we have observed this week. Most active--Rocky Road (by a lot). Most relaxed--Junior Mint and Butter Pecan. Cutest--French Vanilla and Rocky Road. ​Most cuddly--still all of them! Butter Pecan is a very loving puppy. She likes to play fight. She has a sweet disposition and likes to cuddle. French Vanilla is our most active girl puppy (by a little over Pina Colada). As you will see from the pictures, she is very cute. She loves to be petted and thrives on attention. Pina Colada is active, cute and likes to be petted. She is a sweet girl and is loving. Cheesecake is still the second largest puppy. He likes to play fight with Pina Colada and French Vanilla. He loves to be held and to just be near you. Chunky Monkey is the biggest puppy and he likes to play fight with White Chocolate Blizzard and Rocky Road. He has nice wide set eyes, and seems to have the thickest coat. He likes to be held and to lick feet. Junior Mint is the smallest puppy and is very loving. He doesn't play fight. He does love to run around though. He is very loving and has an incredibly sweet face. Rocky Road is definitely the most active puppy. He will play fight with anybody He has grown a lot this past week though he remains our second smallest boy. That means that we now have 5 larger boy puppies. He is so playful that he actually took on three puppies at once. It was his total joy! With all that, he still loves to be held. Tigertail has also grown a lot this week and is now just barely smaller than White Chocolate Blizzard. He loves to explore and be held (interesting combination). He play fights with White Chocolate Blizzard. White Chocolate Blizzard (yes, I put the wrong name on all of these and it is impossible to edit out now) likes playing with Rocky Road and Tigertail. He is beautiful, loves to explore, and to be petted. Week 4: The puppies are continuing to grow and are looking spectacular. The biggest change this week, that I can see, is that it looks like they are going to get their father's coat. He has a rich, full, curly coat and already the puppies are showing signs that they are going to have his wavy coat They continue to play together and are starting to get distinct personalities. This is still fairly early to be set though we are seeing consistent trends for several of the puppies. Most active--Rocky Road. Most inquisitive--Tigertail. Largest--Chunky Monkey. Most relaxed--Junior Mint. Most cuddly--all of them! They have all gone through the neurological stimulation and it is evident that they are very smart as they pick up on our daily routine already. The puppies are stunning and I think you will begin to see what they will develop into. Hope you enjoy. Butter Pecan is our largest girl. She loves to be held and petted. Occasionally she will play fight with the others. She has a beautiful face, build, and coat. French Vanilla is active and loves to run around and play. She is our smallest girl--though not by much. She has a nice white coat and cute face. Pina Colada is very active and energetic. She likes to play fight and has a cute little growl. She is our second largest girl and has a really nice coat. Cheesecake is our second biggest puppy. He is one of our relaxed puppies but we do see him play fight. He has a nice thick coat as well. Chunky Monkey is living up to his name--he is our biggest puppy. He has gorgeous, wide-set eyes and a thick, fluffy coat. He likes to play fight and be held. Rocky Road and him are regular play fighters. Junior Mint is our smallest puppy. However, now that they are eating solid food along with nursing, he is gaining in size. He loves to be petted and does not play fight (at least we have never seen him do so). He loves to run around but we consider him the most relaxed of our puppies. Rocky Road is one of the smaller puppies. However, he loves to play fight and is one of our most active puppies. He is more likely to want to play than to just sit and be petted at this point. He will play fight with anyone willing to play fight back. Tigertail is about the same size as Rocky Road and he also loves to play fight. However, he is a little more relaxed and loves being petted too. He is one of our most inquisitive puppies. You will find him exploring anything new in his environment. White Chocolate Blizzard is one of our three big boys. He play fights occasionally but loves to be held and petted. Week 3: These are the largest, most developed puppies I have ever had at this point. They crawl around, play fight, eat solid food, and already have unique personalities. Normally I wait until week 4 for their first individual pictures because they don't keep their heads up when walking until then. These puppies have already mastered that too--though not all do it all the time. Because of that, their individual pictures are below. Also, we have named the puppies. We like to choose a theme so this time they are ice cream flavors and cake varieties. Hope you enjoy! A word of caution: cute pictures need to be balanced with all the rest of their characteristics. I will try to describe what my son and I see so that you can get the best possible idea of what they are like. Some puppies have more pictures than others--that is just a function of my photography. Butter Pecan play fights once in a while but is mostly relaxed. She is very calm and loves to be petted. French Vanilla is a very active puppy that loves to play fight. She is one of the smaller puppies. Pina Colada play fights occasionally and is also a smaller puppy. Cheesecake is the second biggest puppy and he loves to play fight with Rocky Road. He is also cuddly. Chunky Monkey is our biggest puppy and he also likes play fighting with Rocky Road. He is a fairly active puppy. Junior Mint is our smallest puppy--by quite a bit. He is very loving and likes to play fight at times as well. For now, he is my son's favorite puppy. Rocky Road likes play fighting with Chunky Monkey and Cheesecake. Even though he is quite a bit smaller, he puts up a good fight. He is very active. Tigertail is about the same size as Rocky Road and likes to play fight with everyone. He is very active but also likes to cuddle in our arms. White Chocolate Blizzard is our 3rd biggest puppy--just barely smaller than Cheesecake. He is very relaxed but will occasionally play fight. Day 17: These puppies are amazing! They are big, beautiful and already walk. I even saw two of them play fighting today! They are really growing up quickly. I saw two go into the solid food bowl today as well. Day 12: The puppies are getting fat (that's really good). They are just beginning to open their eyes and are also starting to crawl with all four feet. It is amazing at how fast they move and at how far they can go already. Day 8: Orcrist's Puppies are growing really fast and are getting fat. 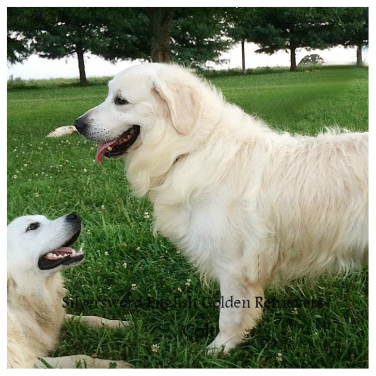 They have had an excellent response to the neurological stimulation--you can see that they are learning to predict what will come next and are having the typical golden retriever response--relaxed and accepting of what you bring. They have almost completely changed to their black skin, with just a hint of the pink still showing. Orcrist is doing great and loves being a mother. Day 3: The puppies have their dew claws removed. They are all healthy and really handled the removal well. They were the most quiet litter that I have had for this procedure. As you will see from the day 3 pictures, their noses and claws are starting to change from pink to black. Orcrist continues to be a spectacular mother. Neurological stimulation starts tomorrow. That is always a neat time--getting to see how they respond. Orcrist has nine puppies! They are all doing really well--Orcrist is my super-mom, always moving puppies in and out to make sure they are all eating and well cared for. She makes this very easy for me. She also adores her little puppies as you will see in the pictures. She often will take one puppy up in her front feet just to love on. It is so amazing to see her mothering.